Hotpoint Dishwasher Full Size. Collection in person only. Ex-display ; as new . Photos are taken by us and, therefore, are of the actual item you would receive. What you see is what you get. Comes with 6-month warranty - T&C in the description. Condition is used. This has many more years of use left. Height: 85cm. Depth: 58cm. Width: 44cm. Hotpoint Aquarius DF61 Freestanding Dishwasher white fits 60cm space with instruction leaflet In Working order Collection only. Cash on collection. Collection only from Cheadle. Hotpoint LSTF 9H117 Slimline integrated Dishwasher in full working order. Collect TN13. Noise level47 dB. Number of wash temperatures 2. Half load option Yes. 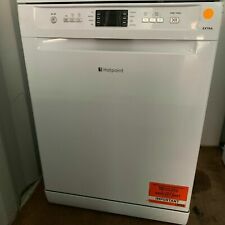 Hotpoint Dishwasher model number FDLET 31120. Condition is Used but in perfect working order and in excellent condition. Sadly it doesn’t fit in our new house, only reason for sale. Any questions please ask. Cash on collection and pick up only. Happy bidding. 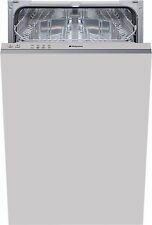 Hotpoint Futura Dishwasher FDFL11010G full size dishwasher. Condition is Used. Full working order, one slight dent on inside of door which is in photos. Not seen when closed. Pick up only hence low start price. Only selling as moved house and there is an integrated dishwasher already in place! (Hotpoint Aquarius LTB4B019 Full-size Integrated Dishwasher. Full-size integrated dishwasher. 1.9) If you are worried about your drive way or flooring inside of the property it is your responsibility to make sure it is covered with a protective sheet or inform us before we arrive. 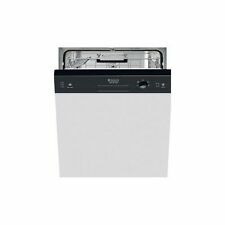 Hotpoint slimline DWS-DEA603-S dishwasher. Condition is Used. Collection only. Use the 9L cycle for an efficient way to clean your dishes the Digital Interface lets you easily select the best program for your needs including Rapid and Half-Load cycles. TheHotpoint HFC3C26W is a 60cm wide dishwasher with the capacity for 14 place settings with the latest and technology to give you the best wash performance coupled with the best energy efficiency. The Hotpoint LTB4B019 is a full size, fully integrated dishwasher. This dishwasher has it all it needs such as including an eco-wash and fast wash cycles. This item will be unboxed, bubble wrapped and bound to a pallet. 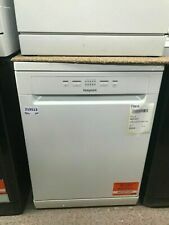 **hotpoint** aquarius dishwasher FDAL28 WHITE BARGAIN . Condition is Used. Collection in person only. In good working order. Been serviced recently with both wash arms replaced. 60cm x60cm x 86cm high. Hose for cold water connection with waste pipe included ready plugged to hook up. Has our old kitchen wood trim still on it. 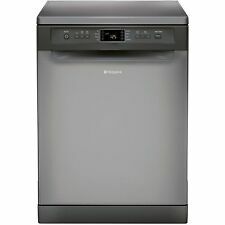 hotpoint SDL510 slimline dishwasher graphite. Condition is Used. Very good condition. Collection in person or can deliver within 10 mile radius for £20.00. HOTPOINT LTF 8B019 Aquarius Full-size Integrated Dishwasher - Graphite -Condition is New. Box contents: Hotpoint LTF 8B019 Full-size Integrated Dishwasher, User manual x 1. Hotpoint LTF 8B019 Full-size Integrated Dishwasher, User manual x 1. Hotpoint aquarius dishwasher FDAL 11010. Condition is Used. Has a slight dent on the side, however this doesn't affect use and not visible when under counter. hotpoint dishwasher. New price is £269 in Curry’s. c12 months old Very good used condition, works perfectly, easy to use ....selling due to extension and new kitchen. Hotpoint "FDFEX11011K" 13 Place Dishwasher in Black. The stylish Hotpoint Extra FDFEX11011K dishwasher saves you from many hours stood at the sink. It's simple to use via adigital display on the dishwasher front, aheight adjustable top basket gives you plenty of flexibility and flood protection ensures your peace of mind. Hotpoint Aquarius Dishwasher. Condition is Used. Used less than a handful of times and only being replaced due to new kitchen which had a new one as part of the deal. With salt and rinse aid indicators making it easy to keep the FDAL11010P well maintained, this Hotpoint appliance really does help to take the stress out of doing the dishes. Hang up the rubber gloves and let Hotpoint do the dirty work in the kitchen with the Hotpoint FDAL11010P Full-size Dishwasher. Manufacturer : Hotpoint. ONE OF OUR BEST BUYS EVER. all have been tested. Our office hours are Dry performance: A. ISLE OF MAN/WIGHT, SHETLANDS, NORTHERN/SCOTTISH ISLES, N.IRELAND, ETC. Cash on collection. MODEL FDYB10011G. depth 600mm. width 600mm. Hotpoint HFSO 3T223WX 45cm Slim-Line. Super Silent 43db Operation - great for open plan kitchens or simply a quiet life! Turbo Wash option - great for when you're in a hurry e.g. dinner parties. Uses only 9 litres of water and only 0.74kwh energy per wash cycle. Leave your crockery shining after every wash with this white Hotpoint dishwasher. It has enough space inside to clean 14 place settings at once making it ideal for washing-up in medium-sized households. The really efficient A energy rating means its kind to your utility bills as well. When you need your plates cleaned before you go out the 30 minute quick wash leaves them spotless in no time. For stubborn baked-on food just place your cookware in one basket and 3D Zone Wash will focus 40 percent more cleaning power to that area so you wont have to scrub your casserole dishes. Hotpoint FDAB10110P. An Eco Cycle cleans your dishes using less energy. A counterbalanced door stays put at any angle without you having to prop it up. This makes loading and unloading your dishwasher easier, and safer. With the stylish Hotpoint Extra FDFEX11011K dishwasher it will save you from many hours stood at the sink having to manually wash all the cutlery yourself. With 13 place settings this dishwasher is ideal for a familys daily needs as it will keep your crockery and cutlery all in tip-top condition while you enjoy putting your feet up at the end of the day The dishwasher has been rated A for energy as well as A rated for clean and drying it will give all your pots a beautiful sparkle while keeping your bills low and looking after the environment. There are 8 programmes and 2 temperature setting to choose from with special options including eco intensive and glass/delicate. Hotpoint Aquarius dishwasher, 4 months old, excellent condition,9 place settings. Condition is Used. Collection in person only. The model number is FDAL11010P, and t his dishwasher has 13 place settings. Here we have aRECONDITIONED HOTPOINT AQUARIUS Full Size Dishwasher finished in White. The machine features a height adjustable top basket even when fully loaded. Hotpoint slimline dishwasher. Only 9 months old, in perfect order and excellent condition. Selling due to house move. 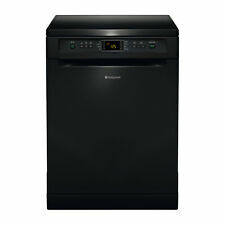 Hotpoint black eco tech full size free standing dishwasher. Only been used for 2-3 months, then moved house. Unfortunately there isn’t room in the new kitchen for it. Gutted to be selling it but it’s pointless it just sitting there. There is a small dent on the front of the door which happened when we moved. Grab a bargain. LOCAL PICK UP ONLY from IP20 9FB Cash on collection preferred. Condition is Used. You will be able to benefit from this free standing Dishwasher quick wash feature. White/Silver Hotpoint Dishwasher. Hotpoint YouTube. Why Hotpoint?. About Hotpoint. Hotpoint is operated by Whirlpool UK Appliances Limited. Large Appliances (e.g. Washing Machines). Small Appliances (e.g. Kettles).